These stocks from housing, retail, and logistics enjoy strong tailwinds to propel them even higher. Stocks that have doubled in a short span are often considered frothy, but that only holds true if they've run up too much too fast, riding the market's short-term sentiments and biases. If the rally is backed by a company's strong fundamentals and growth prospects, there's little reason to believe a stock that has doubled won't triple (or more). So, when we asked three of our Motley Fool contributors to each name a stock that has doubled and still has room to grow, they picked lululemon athletica (NASDAQ:LULU), LGI Homes Inc (NASDAQ:LGIH), and XPO Logistics (NYSE:XPO). Here's why. Neha Chamaria (XPO Logistics): In less than two years' time, XPO Logistics shares have soared nearly 150% despite fears of e-commerce giants like Amazon starting their own shipping services. XPO's longer-term returns are even better. An asset-light business model, opportunistic acquisitions, and an edge in the crucial last-mile delivery space pretty much sums up XPO's solid performance over the years. The last bit, in particular, also holds the key to XPO's growth. Last-mile involves the final leg of delivery of goods from a local retailer or distribution center to the customer's doorstep and is often complex, especially for heavy goods like furniture and home appliances that also require deft handling, installation, and pick up of old product, among other things. Last-mile is where the opportunities lie as e-commerce takes off. Having made some smart moves in the early stages, XPO is North America's largest last-mile provider today. During its most recent quarter, XPO watched its revenue, net income, and cash flows hit record quarterly highs, setting the pace for yet another strong year for the company. The company is also on the lookout for acquisitions even as it boosts investments in technology-driven services such as a digital freight marketplace and a mobile app for brokerage carriers. XPO has made some of the smartest acquisitions in previous years, so I trust management will put money to good use again, driving XPO through the next growth phase. 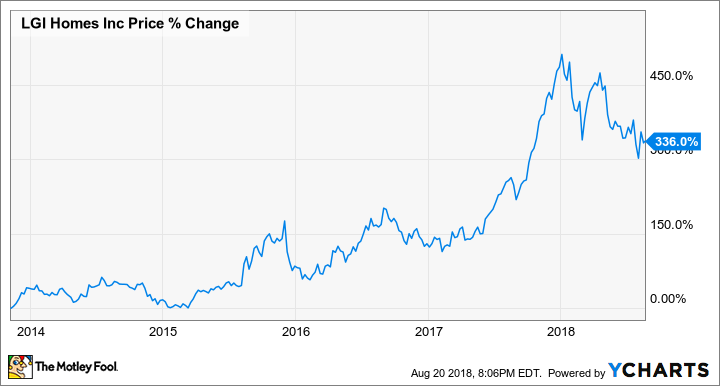 Jason Hall (LGI Homes): Since going public less than five years ago, shares of small homebuilder LGI Homes are up an incredible 336%, even after falling 30% so far in 2018. However, despite Mr. Market's sharp reversal in interest on fears that home sales are about to stall, there are plenty of reasons to like the company going forward. To start, high prices have played a role in keeping millennials out of the housing market, but much of that is due to a lack of inventory. Since the global financial crisis, homebuilders have eschewed the entry-level market for nearly a decade, and focused on luxury homes. The end result is far too few affordable homes in many markets, driving prices even further out of reach. LGI Homes is working to change this, and its efforts are paying off with big profits. Last quarter, revenue shot up an incredible 72%, while earnings per share more than doubled. The company isn't likely to deliver that kind of growth every quarter, but its singular focus on smaller, lower-cost housing has it well positioned in the sweet spot of housing demand for years to come. Lastly, the stock price is down 29% this year, and it now trades for 9.7 times trailing earnings, and 8.7 times 2018 earnings estimates. There's short-term risk since homebuilders use a lot of debt to fund land before starting development, but over the long term, I expect LGI Homes to reward patient investors with lots more growth. Dan Caplinger (lululemon athletica): The fitness trend is still ver popular, and companies that have successfully helped ordinary people embrace a culture of healthy exercise and activity have seen their share prices rewarded over the years. In retail, lululemon athletica was one of the first to set the standard in athletic apparel, with its emphasis on the yoga movement gaining a natural following of customers. The explosive growth that resulted suffered a setback when lululemon made a quality-control mistake that led to a major recall of yoga pants and raised questions about whether the corporate culture had permanently changed for the worse. Since that debacle, though, lululemon has done a good job of restoring its reputation and winning back its customer base. Over the past year, lululemon stock has risen by more than 125%, and the company can attribute its success to multiple causes. On one hand, the yoga retailer has simply catered to its core customers, following a very similar strategy to the one that initially brought it to worldwide prominence. Yet lululemon has also sought to expand its target audience, and strategies to attract more men into its store locations have borne fruit and opened up a new pathway toward accelerated growth. With its bad times firmly behind it, lululemon still has a lot of room to grow both in its fundamental business and its share price.